A reinforced end tab lets you handle files frequently with less wear and tear, making these pocket folders a good choice in busy offices. The letter file folders have tabs along the side for flexible filing systems, including open shelf filing and general filing. Store documents and digital data with these Smead manila end-tab pocket folders. With extra pockets for CDs and papers, the folders help your company keep pace with digital record keeping. Fasteners securely hold important papers in place, and end tabs along the side are just right for open-shelf filing. 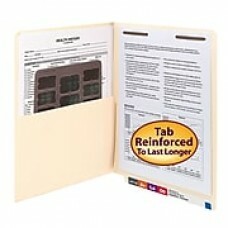 With B-style fasteners, each folder securely holds stacks of paper up to 2 inches thick. The fasteners keep everything in its proper order, so documents always stay sorted even if a file is accidentally dropped. Ideal for patient files and individual cases, the fastener folders add a level of security to your office, making individual papers harder to lose. These manila folders hold media with a die cut CD storage pocket, allowing you to file corresponding DVDs or data discs. The folders also feature an interior pocket for storing extra papers. A reinforced end tab lets you handle files frequently with less wear and tear, making these pocket folders a good choice in busy offices. The letter file folders have tabs along the side for flexible filing systems, including open-shelf filing and general filing.